River Fest, presented by Case's Pork Roll, will take place on Saturday September 29 at ARM & HAMMER Park. The team's annual postseason event featuring the Case's Pork Roll Eating Championship where Major League Eating stars compete to eat as many pork roll sandwiches as possible in ten minutes. At last year's event, the Garden State's #1-ranked eater, Carmen Cincotti, ate 40 quarter-pound Case's Pork Roll Sandwiches in 10 minutesto take first, earning $2,000 and the respect of New Jerseyans from Rockleigh to Cape May. The world record in this discipline is held by one Joey Chestnut, who ate 43 Case's Pork Roll Sandwiches in 10 minutes at the 2016 Championship. Tonight at ARM & HAMMER Park, when the Thunder host the Bowie Baysox, all fans can purchase $1 pork roll sandwiches as part of the team's Pork Roll Celebration night in which the team re-brands to become the Thunder Pork Roll. As well, fans can purchase tickets to River Fest, presented by Case's Pork Roll, for just $3 at Fan Services. 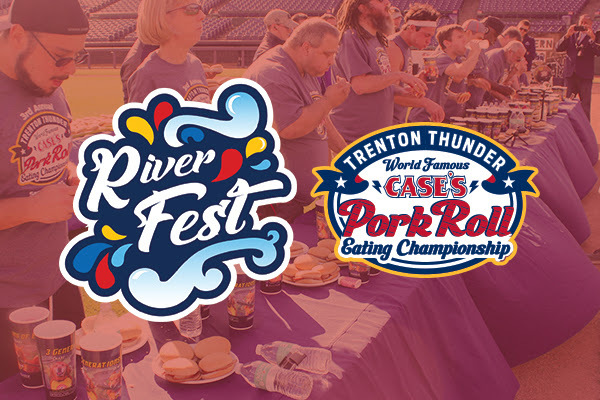 River Fest will feature an array of "pork roll-inspired" food selections at the concession stands including many of the favorites currently served at the Case's Pork Roll stand at ARM & HAMMER Park. Beer sales will include Fall pumpkin selections from various breweries during the fourth annual event. A variety of kid-friendly outdoor games, including inflatables, and bounce houses will be part of the day's activities, free of charge. Your Thunder, presented by NJM Insurance, are in the midst of their 25th season in franchise history. For the latest information on Thunder baseball or to purchase tickets, visit www.TrentonThunder.com or call 609-394-3300.